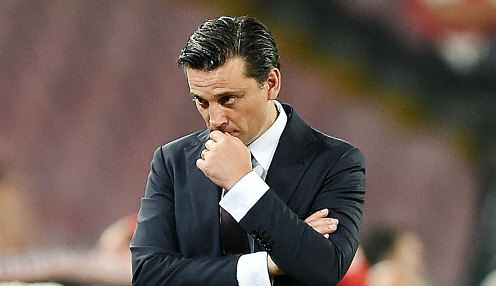 AC Milan head coach Vincenzo Montella has been handed a vote of confidence following Sunday's disappointing 2-0 home defeat to Roma. Carlo Ancelotti, who was axed by Bayern Munich last week, is being linked with a return to the club he managed between 2001 and 2009. During his spell with the Rossoneri, they won Serie A, Champions League, Coppa Italia, Supercoppa Italiana, UEFA Super Cup and Club World Cup titles. After leaving Milan, the 58-year-old has enjoyed spells with Chelsea, Paris St-Germain, Real Madrid and Bayern. The Serie A side's director Massimiliano Mirabelli insisted after the loss to Roma: "We are only seven rounds in, we have a new team, so no coach has a magic wand. "You can't get certain results straight away. We have a group of players who need to become a team, so as far as we are concerned, Montella is working well. We just have to hope that work brings important results." Milan finished the match against Roma with ten men after Hakan Calhanoglu was sent off in the 80th minute. Milan are seventh in the Serie A table, nine points behind leaders Napoli, who are 50/1 to win the title this season. AC Milan can be backed at 12121/1 to finish at the top of the standings and Juventus at 1/10000.